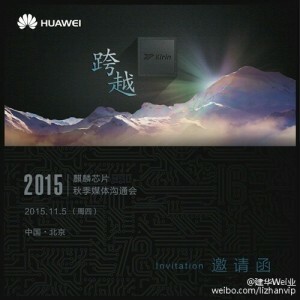 Huawei's next top of the line Kirin chipset is all set to become official on November 5, at a special event. The Chinese company is sending out invites for the gathering to media outlets in the country, and they look like the image you can see to the left. There's no doubt that this event will be all about a Kirin chipset, even if its exact model isn't mentioned in the material. Many months of rumors however have pegged this as being the Kirin 950, which we've even seen getting benchmarked back in August. Now it looks like Huawei is done tuning it, and is ready to announce the Kirin 950. The source of the event invite image says the SoC's CPU will feature Cortex-A72 cores, Cat.10 LTE connectivity, and will be made on TSMC's 16nm FinFET process. That aforementioned benchmark gave us a fuller picture. The Kirin 950 will come with an octa-core CPU. Four of those cores will indeed by Cortex-A72, ARM's newest high-performing design. These cores will be clocked at up to 2.4 GHz. The other four will be Cortex-A57 cores, while the GPU is a Mali-T880. The chipset supports LPDDR4 RAM. With such specs, it's not surprising that the Kirin 950 received higher benchmark scores than Samsung's Exynos 7420, which is inside all four of its 2015 flagships. Samsung: "Shi*, unleash/leak the Note 6"
Do not compare A72 with A53. A72 is for power/heavy tasks and A53 is for power saving when the phone run maintenance and simple tasks. This combination of A72/A53 cores will be available in 2016. In 2015 CPU's was used A57/A53 cores (Exynos 7420).